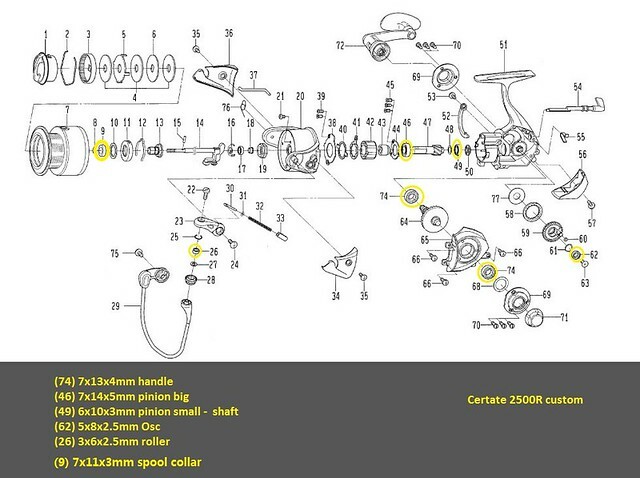 This is a beginner's guide to assembling the reel. I am no reel expert, just sharing what I did on a boring bad weather weekend. Feel free to point out any mistake. You can also work this procedure backward to figure out how to strip it apart. 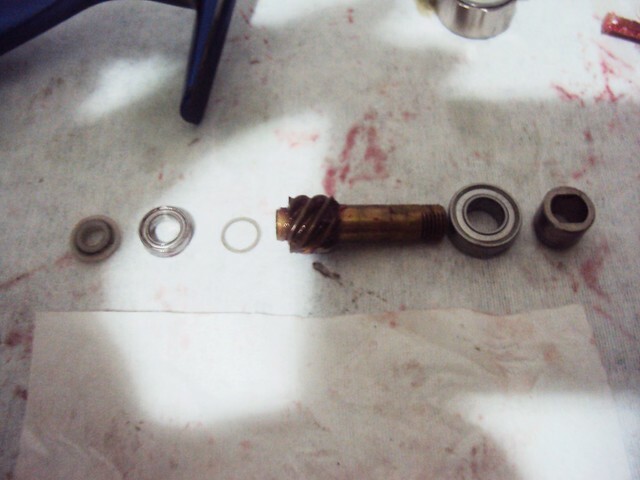 Maintenance on the bearings and gears, greasing and de-greasing procedure can be found elsewhere. This is the schematic of a normal 2500 certate (2004), which I used for reference only. 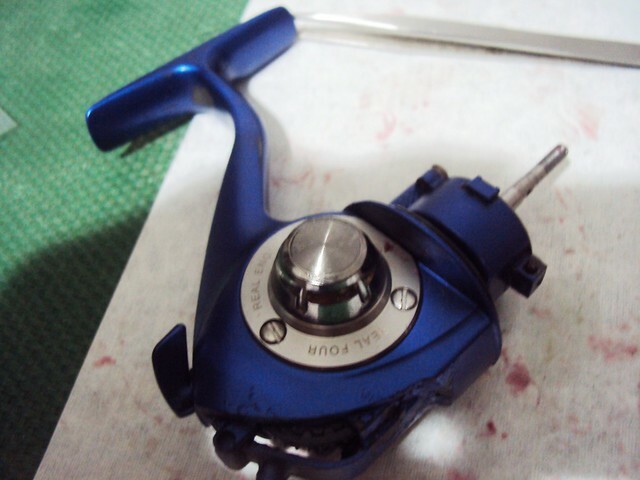 My actual reel is a 2500 R custom. 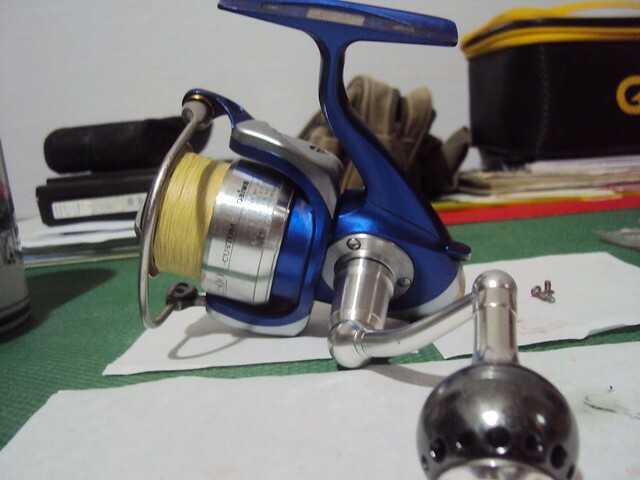 The bearing sizes are measured on my actual reel. This procedure only touch on the main body. I will not go into the clicker, drag and bail-arm compartment. 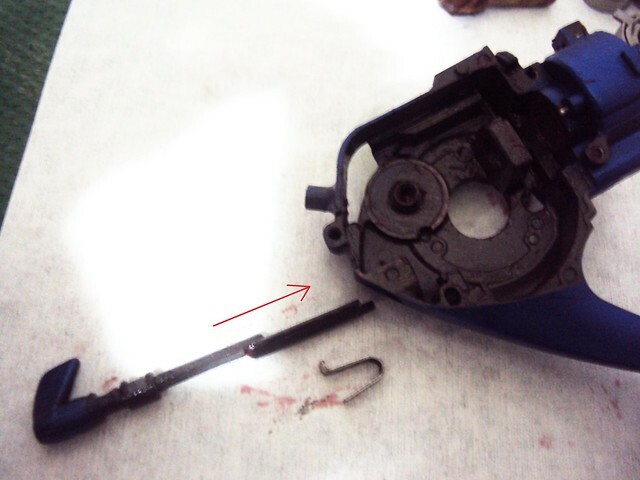 First to go in is the Anti-Reverse Lever, it is held by a cam spring. 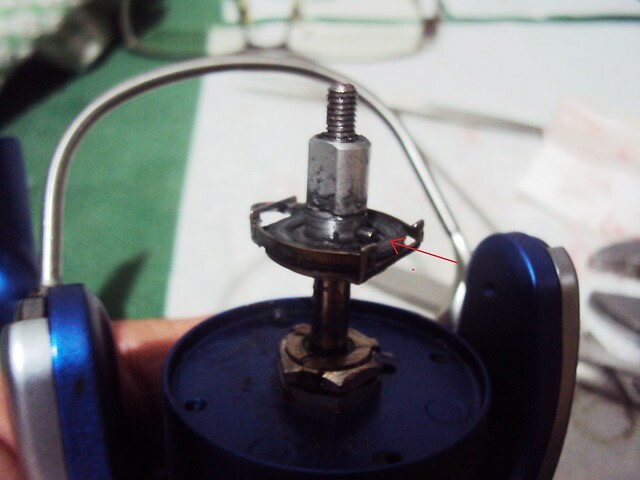 Insert the cam spring in the direction shown, it should snap into place easily. 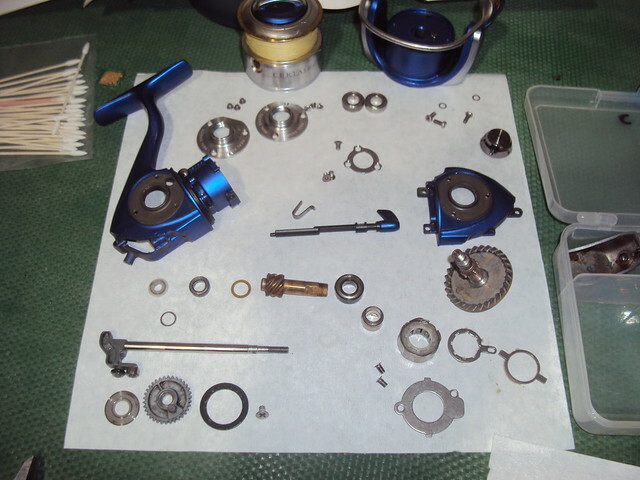 Next is the Osc gear assembly. 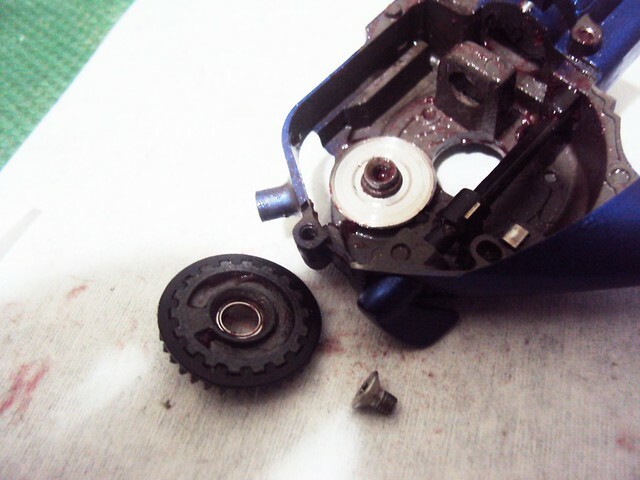 There is a bearing in the gear, this can be very tight fit. 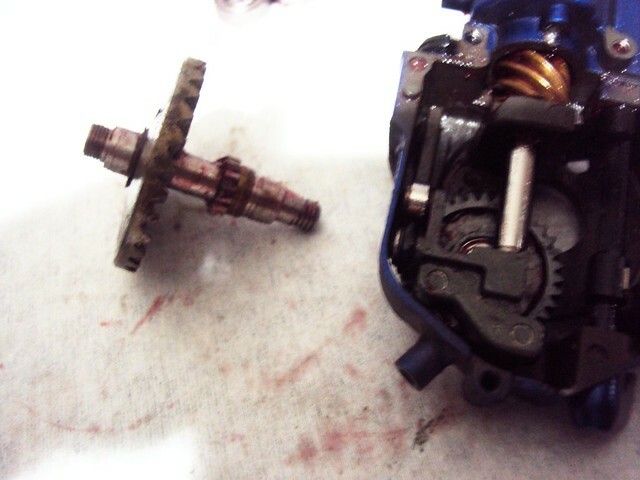 I have to use an Arbor press to get it out, and get it in again. Put on the big shiny washer first. 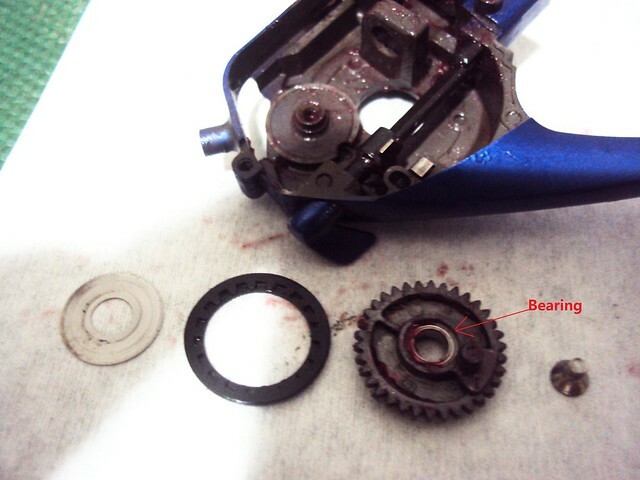 The O-ring and bearing should go onto the gear before placing it into the body. 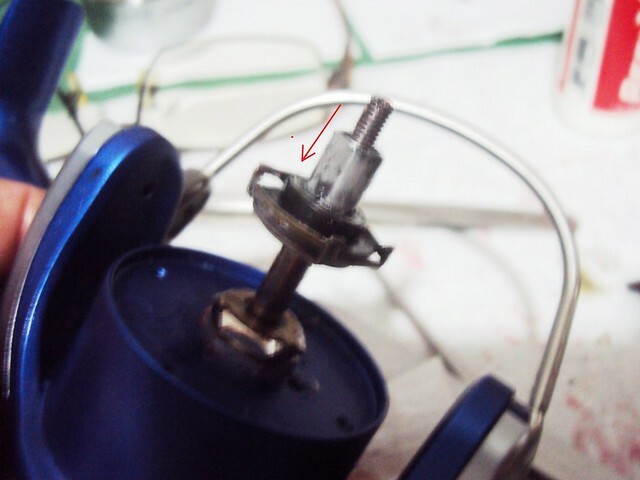 Finally the screw, this is very tight when I removed it. 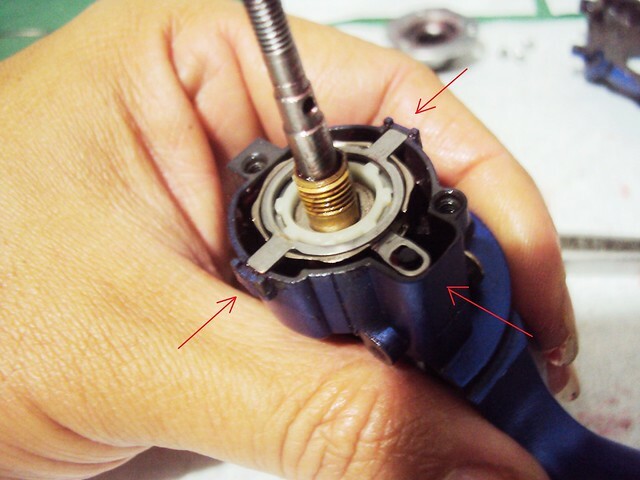 Be careful not to bur the screw head. It has to be flush below the gear. Next to go in is the main shaft. 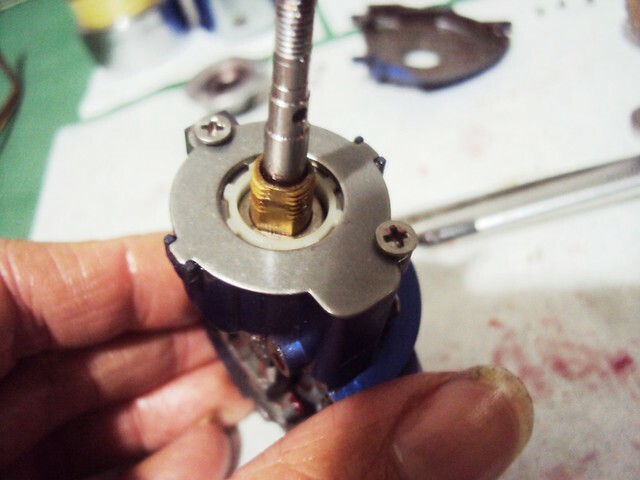 The slot on the shaft have to sit nicely on the stud of the Osc gear. There is also a tiny O-ring on the stud. Insert the main shaft from the direction shown. 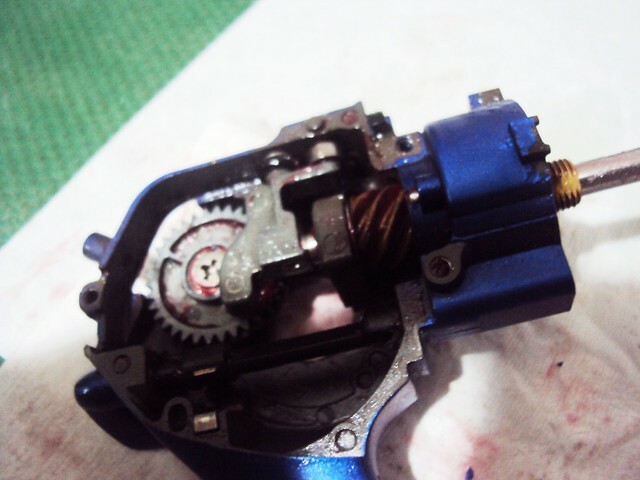 Next is the Pinion gear assembly. Assemble all the 6 parts together. Slide the whole thing into the main shaft as shown. 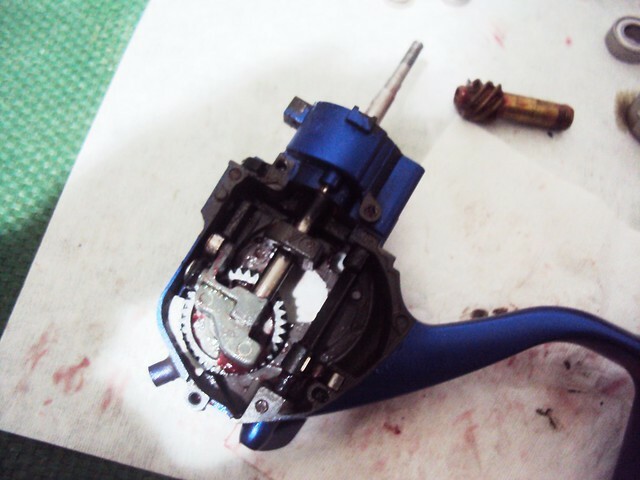 Next, you need to secure the Pinion gear assembly. 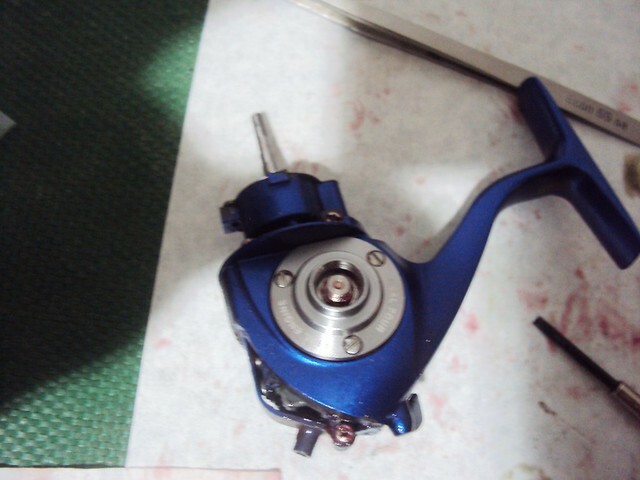 Put on the Bearing Retainer. Put on the 3 screws. 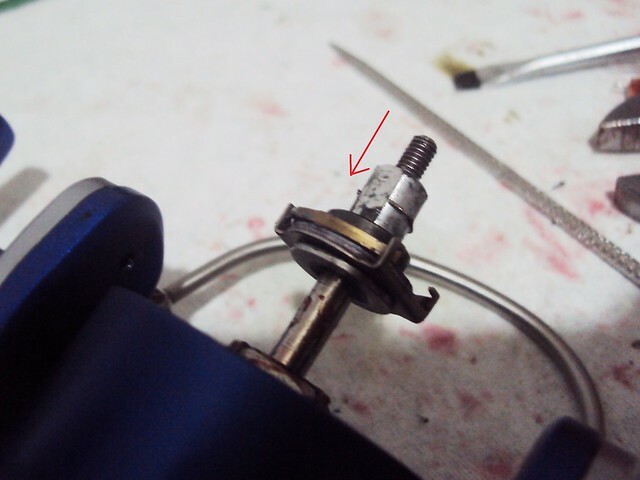 Be very careful with these 3 screws, I strip the head off for 2 of these during the removal. Have to drill and tap it out. 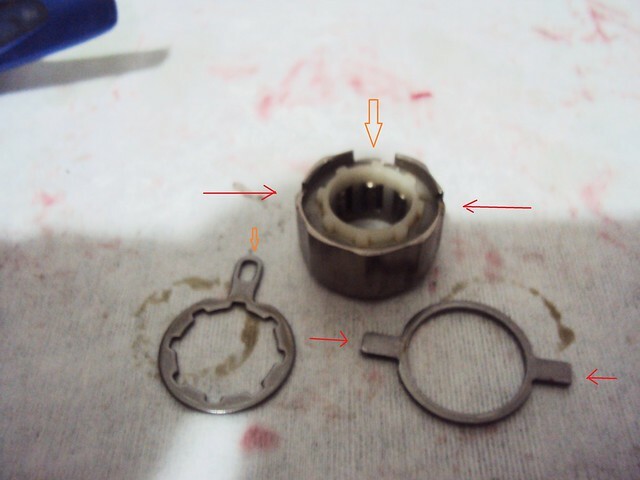 These 3 screws are also pretty special, the countersunk head are very thin so it sits below the Retainer. 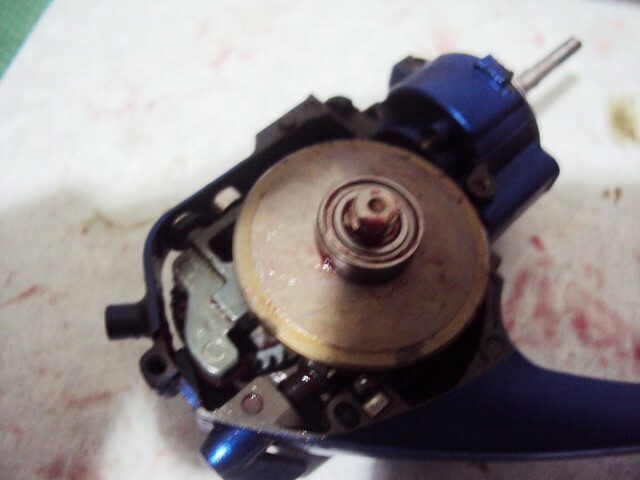 What you see in the picture are replacement screws with the head grind down. 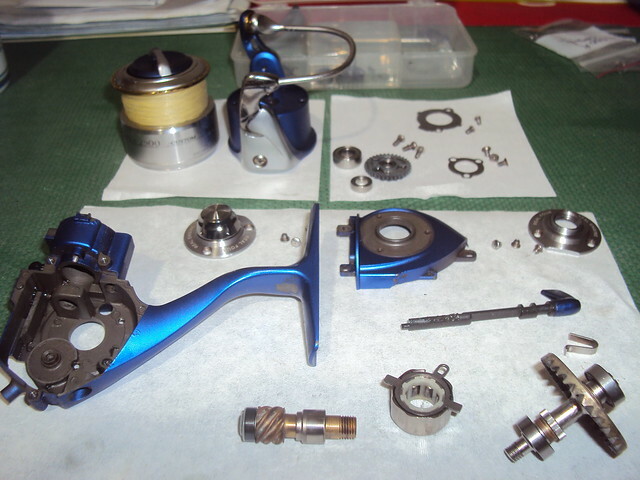 Next is the Anti-Reverse Assembly. No grease here, you can use a very light dose of "Reel-X" oil. 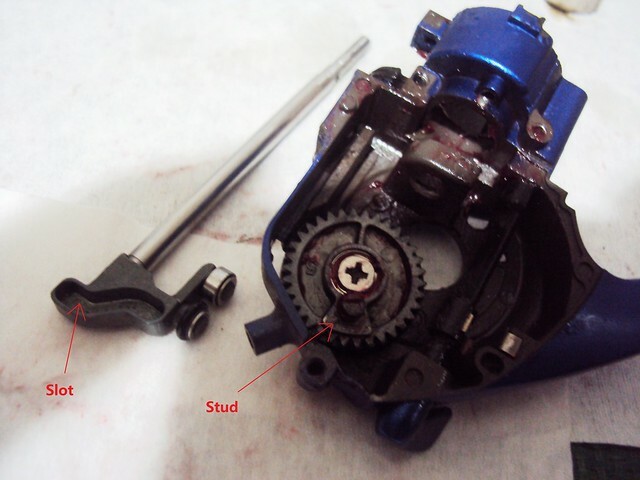 Put on the Clutch Cam, follow by the Cam Retainer. 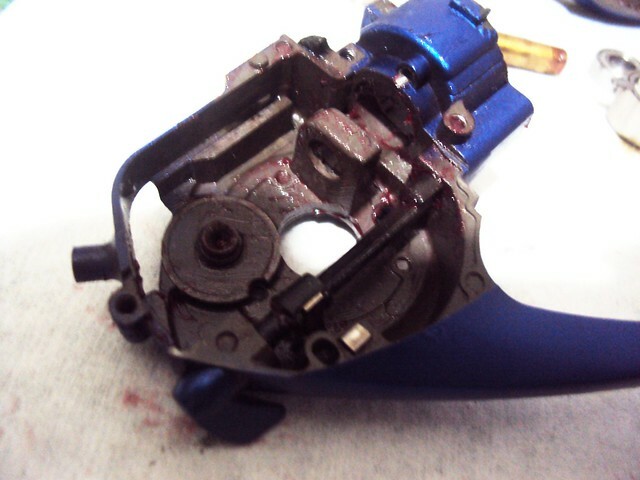 Put the AR bearing assembly into the housing. 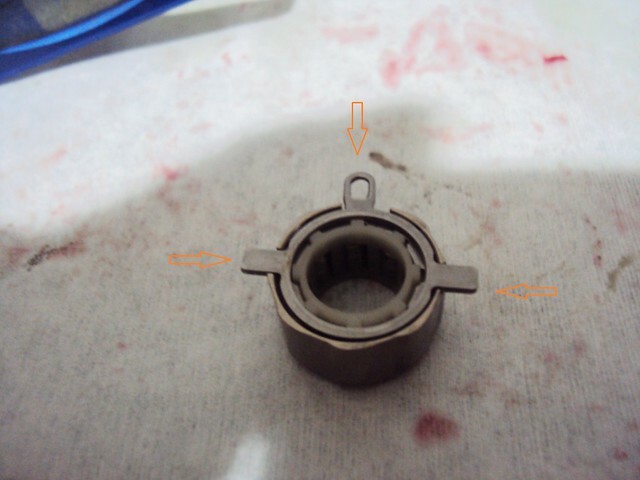 You may have to make adjustment here and there so everything shown sits nicely and flush below the housing. 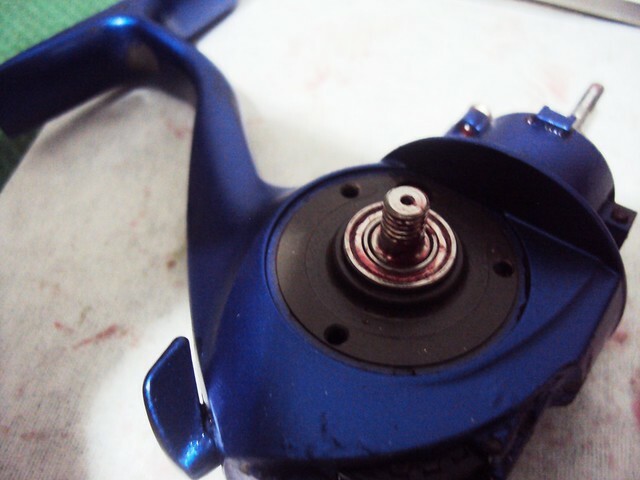 Put on the top Bearing Retainer and secure by 2 screws. 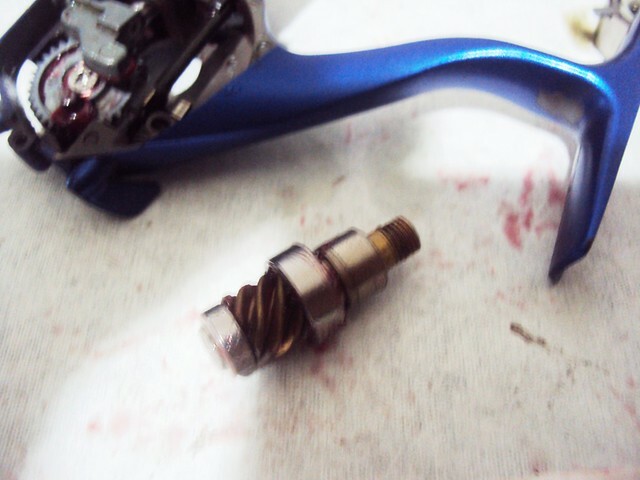 These 2 screws have very thin head too, and are very very tight. Now we are ready for the Drive gear. Wiggle the drive gear into place. 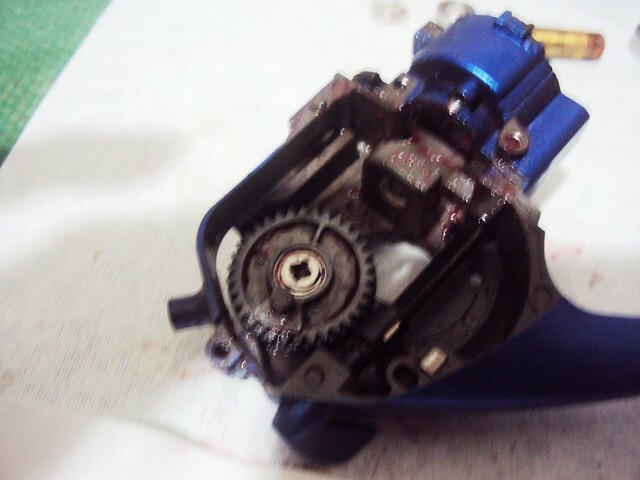 This drives the Pinion gear and Osc gear, so everything have to mesh into place nicely. Put on the handle bearing. Go to the other side and put on the other handle bearing. 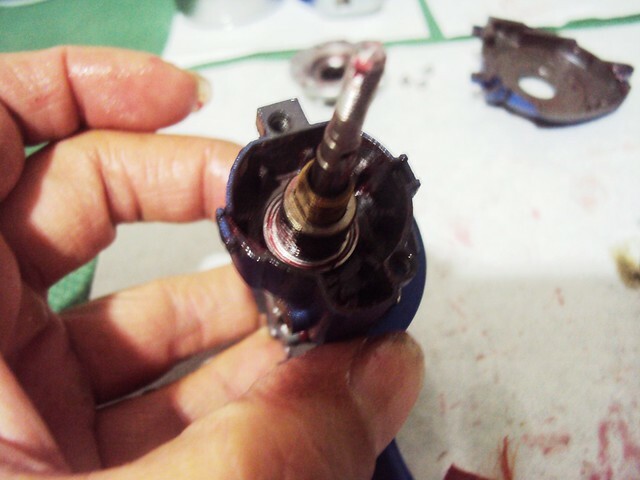 Put on the Engine plate, follow by the 3 screws and cap. Go back to the left side and put on the Side cover, follow by the 3 screws. Engine plate, follow by 3 screws. 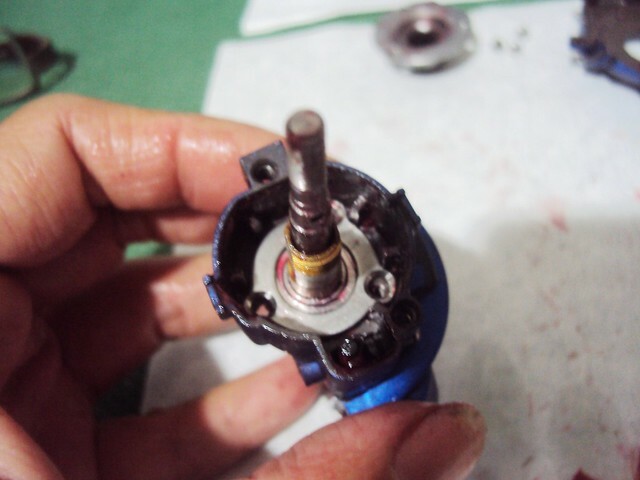 Now you are ready to install the Rotor from the top. You can install the handle at this point and try turning it. 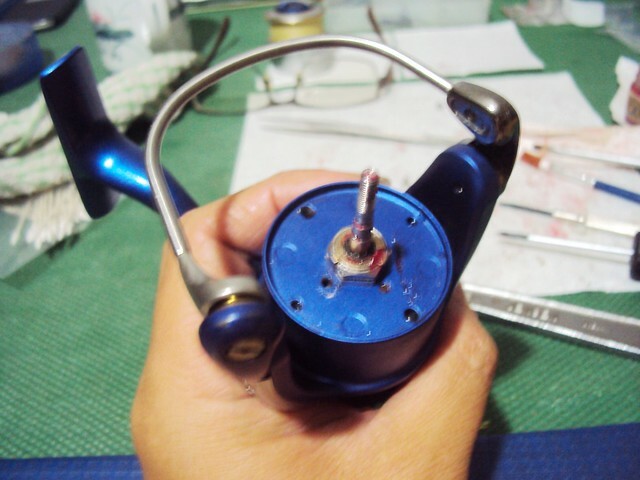 Now is the clicker assembly. 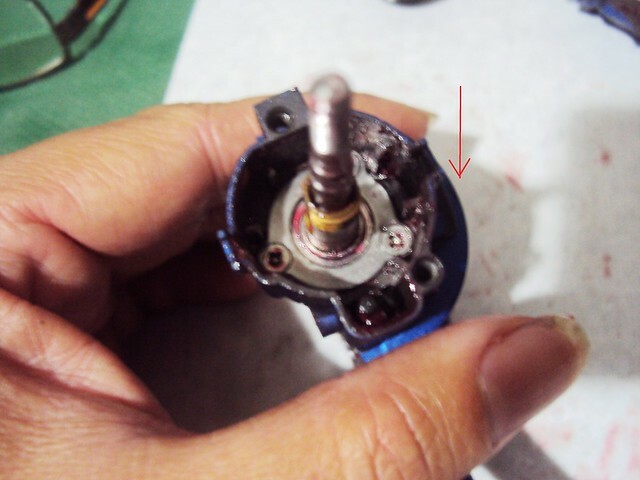 The hole on the assembly should match the hole on the main shaft. Insert the dowel pin in the hole. 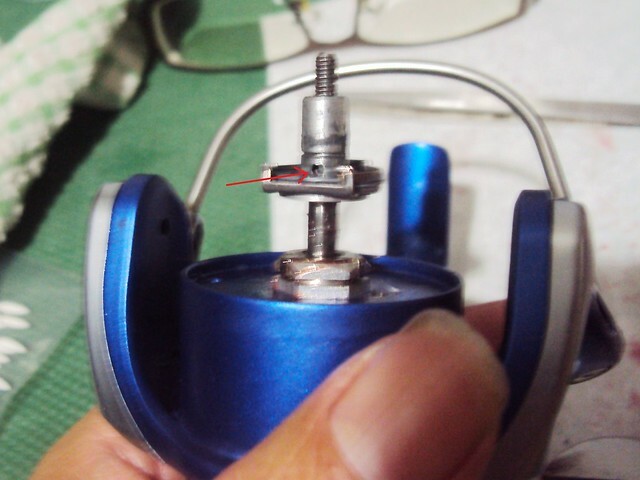 Slide on the spool collar bearing, covering up the pin and hole. 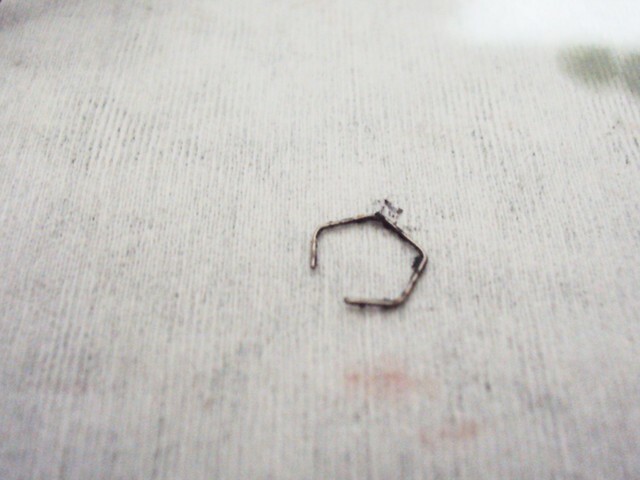 This Spool Retainer is a very tiny piece of wire. 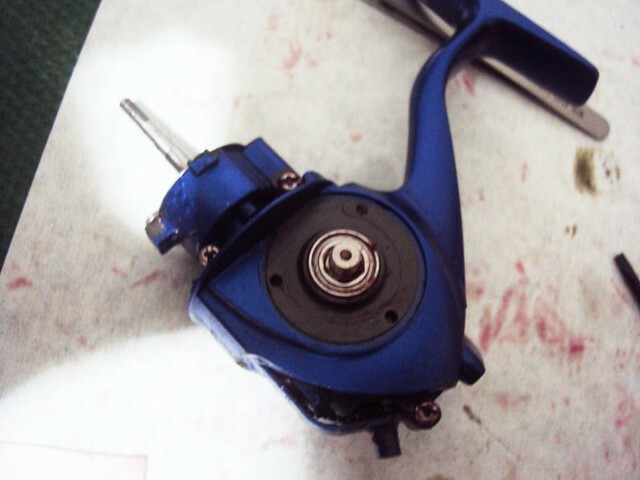 Slide the Retainer into place, slide it all the way down until it sits inside a slot just above the bearing. 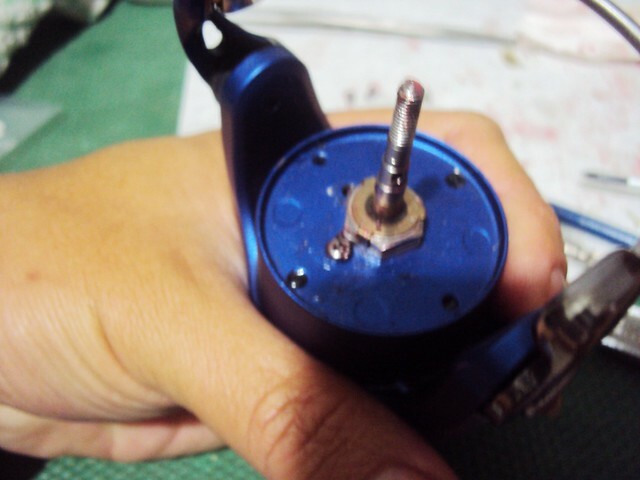 Last is the Spool, Drag knob, follow by the Handle and the Rear Cover. 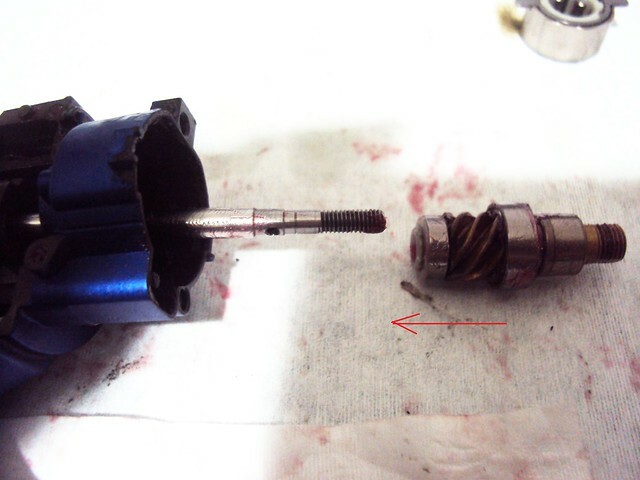 1) The 3 countersunk head screws that held the pinion gear assembly retainer in place, 2 of these got their head strip with a wrong size screw driver. 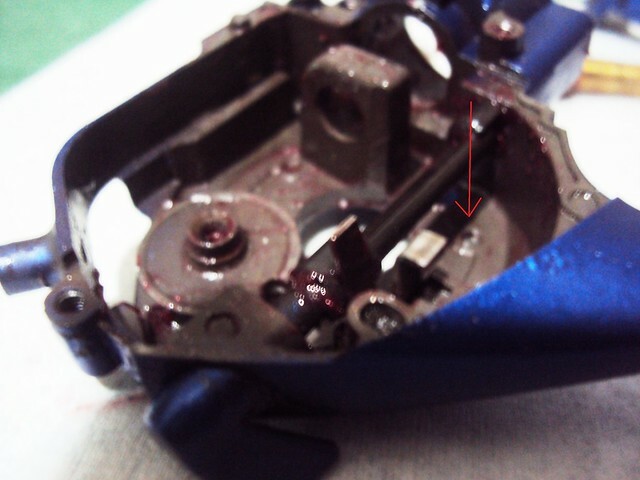 And they are very tight, most probably loctite was used in the factory. 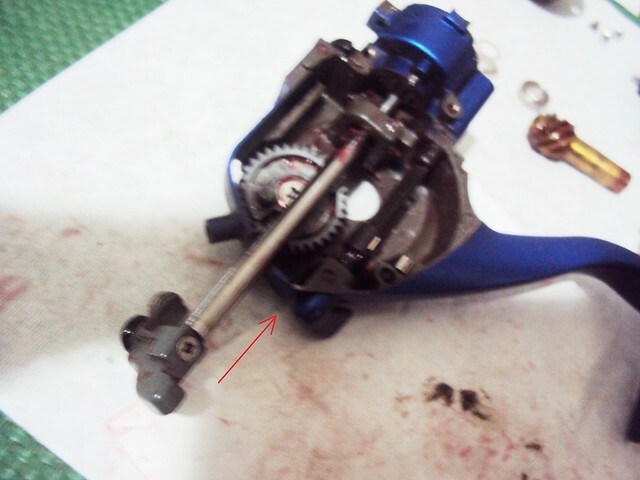 2)The bearing inside the Osc gear is also very tight, I have to use an arbor press to push it out. 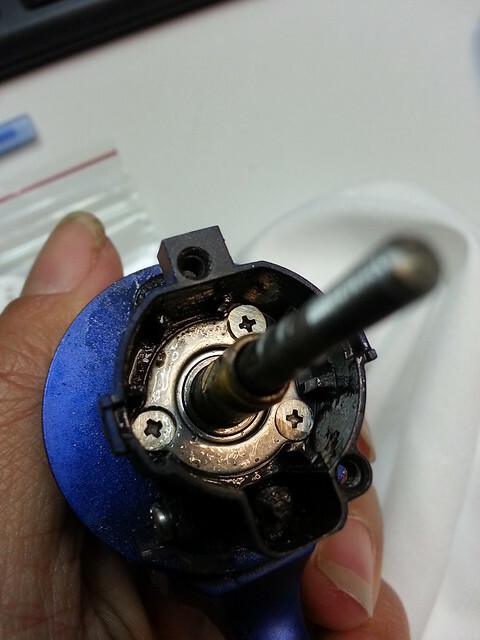 3)The screw on the Osc gear bearing is also very tight, I ended up buring the screw head, this result in the screw head rubbing against the main shaft. 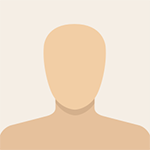 You really need good quality driver in various sizes to start work. Thanks for sharing with words and pictures such detail works. Thank you for this! 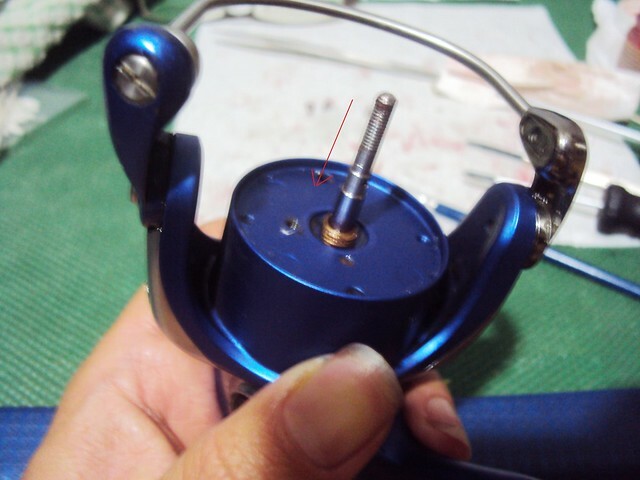 Came across your post while searching how to put this reel back together. Unfortunately, the images in the post doesn't show up anymore! Any idea how we can get them back? I'm sure there are many out there who could benefit from this.